Editor&apos;s Note: Unfortunately, The Sparkling Canvas closed its retail studio operation since this article was published. You still can book private parties on their website at www.theSparklingCanvas.com. Hendricks County has a growing selection of entertainment and art. The Sparkling Canvas, 7900 E. U.S. 36 in Avon, is a great addition that offers creativity and fun for all ages. Owners, Mo and Ashley, mutually enjoy and appreciate art and wine. The Sparkling Canvas is the culmination of this love by allowing visitors to be creative, tap into their artistic abilities, relax with a glass of wine and enjoy friends and family. In addition to the paint and sip experience, The Sparkling Canvas also plans to open a gallery for local artists to display their artwork. That new addition will allow guests to come early for class to take a gallery walk and enjoy the unique artwork from within the community. Pieces also will be available for purchase. How great is that? That artist gallery is scheduled to open in September. Open classes are offered on Friday and Saturday from 7-10 p.m. for $30 a person. That fee includes instruction and all materials needed. An instructor walks guests, step-by-step, through the painting process. Unleash your inner Picasso, you might surprise yourself and have fun in the process. Each class features a different painting. 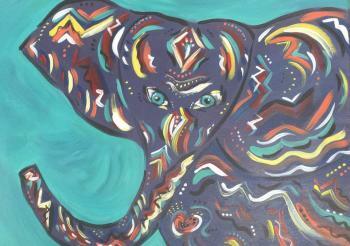 Check out the events calendar to see what paintings are coming up. Click on the class to make your reservation. I love the idea behind these classes because you don&apos;t have to wait for a large group of friends to commit, making for a great date night, girls night or a fun evening with an aunt or your mom. With classes offered weekly, it&apos;s easy to work around even the busiest of schedules. A bar is also available during classes with various cocktail options and a variety of red, white and sparkling wines. Come relax and create a masterpiece while sipping a mimosa before another work week begins. Classes are offered from 1-4 p.m. on Sundays, with the bar serving mimosas on special. Just like Paint and Sip classes, Mimosa Sundays include step-by-step painting instruction and materials for $30 a person. Check out upcoming Mimosa Sunday themes here and click on the date to make your reservation. Bring out the artist in your kiddo on Saturdays from 11 a.m.-1 p.m. These classes are sure to inspire and entertain children with kid-themed paintings like Minions and Pokemon. Candies & Canvas classes include instruction and all materials for $20 a person. These classes would be a perfect play date or family activity. And, did someone say candy? Find scheduled themes and make a reservation here. As awesome as the weekly classes at The Sparkling Canvas are, getting a large group together for a private class would be so fun. With private classes, guests receive more intimate step-by-step instruction -- for a theme of your choosing -- and all materials. 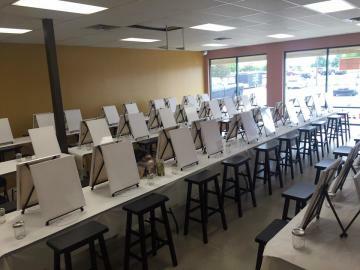 Private classes are great for birthdays, bachelorette parties, work events, or any larger group of friends and family. Wouldn&apos;t a private class be great for a moms group, club, corporate retreat or an end-of-the-season team party? Obviously, a private class would be a perfect Girls Night Out. Mondays, Tuesdays and Wednesdays are devoted to private classes at The Sparkling Canvas, but weekend parties are also available. With that kind of flexibility, surely your best girlfriends can find an open date among their crazy schedules. The bar is also available for private parties. Maybe that will encourage them? Call (317) 363-1596 for more information about private classes or follow The Sparkling Canvas on Facebook for all the latest news and upcoming events. I&apos;m excited about this new addition to the growing entertainment and art scene in Hendricks County. I love the variety of classes being offered and how frequently they&apos;re offered. The inspiration behind The Sparkling Canvas is one that I, as a member of the community Mo and Ashley hoped to share their passion with, truly appreciate. I hope you get a chance to attend a class soon.